Placing musical theater in the hands of tomorrow's leaders. 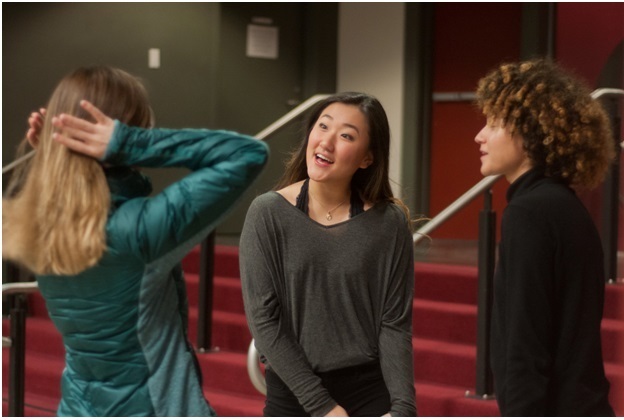 The 5th Avenue Theatre's Rising Star Project offers students the chance to develop professional skills through the process of producing and performing a musical on The 5th Avenue Theatre mainstage. Beyond being entirely student performed, the 2018/19 Rising Star Project production of West Side Story will be run by a student technical crew and supported by a team of students who have taken on roles in the marketing, development, producing, creative and casting departments. All participants are trained and mentored by dedicated theater professionals at The 5th Avenue Theatre. Rising Star Project is a tuition-free program made possible through a generous grant from The Sheri and Les Biller Family Foundation. Rising Star Project focuses on career exploration and the development of professional skills. Participants are embedded within a working department at The 5th Avenue Theatre. Professional mentors work with students to learn skills and execute tasks that are crucial to the day-to-day operations of a regional theater company. A professional musical would not be possible if not for dedicated teams who cast, produce, secure funding for, and market the production. THE PRODUCING TEAM is mentored by the Casting Associate, Associate Production Manager, and Company Manager, Projects include facilitating general auditions and casting, producing the Rising Star Project cabaret fundraiser, and attending to the needs of the Rising Star Project cast and company, Strong candidates have a strong interest in the theater industry or business (thespians, FBLA), are good collaborators, have leadership experience (student government, team athletics), and are comfortable working under deadlines. THE DEVELOPMENT TEAM is mentored by members of the theater’s Development department and is responsible for raising funds for the Rising Star Project production. This team will set a fundraising goal and then create and execute various campaigns to reach their goal. Strong candidates are interested in professional networking and Arts advocacy, are involved in fundraising and service clubs (Key Club, ASB), and are passionate about the Arts and its impact on our community. Behind the scenes, professional musicals require the technical expertise of dedicated craftspeople who take on the additional role of mentoring Rising Star Project participants. HAIR & MAKEUP TEAM will learn essential skills and industry best practices for hair, wigs and makeup. In addition, Hair & Makeup students will put wigs and makeup on actors and perform changes during performances. COSTUMES & WARDROBE TEAM will learn how to fit costumes on actors, alter pieces and “rig” them for quick changes as well as have the opportunity to analyze costume designs and learn about the design process. Students will also iron and prep costumes for the show, assist with quick changes, and “run” the wardrobe aspects of the show backstage during performances. THE CAST will be mentored primarily by theater professionals working on the Rising Star Project creative team—with opportunities to work with members of the professional cast of West Side Story. General auditions for student performers will take place in July 2018 and January 2019. Strong candidates will demonstrate commitment to the project schedule and a demonstrated passion for collaboration. THE ORCHESTRA will be mentored by musicians who play for the professional production of West Side Story. Students will rehearse and perform the score for the Rising Star Project production. Ideal candidates are interested in professional music careers, have experience playing in advanced ensembles, and have an interest in learning diverse musical styles. Musicians should submit a complete application. Strong candidates will be invited to also submit a video audition or to audition in person. The West Side Story orchestra will include: piccolo, flute, clarinet, bass clarinet, oboe, English horn, all saxophones, trumpet, trombone, bass trombone, violin, keyboard, percussion (mallets), drum set, bass, and guitar. STAGE MANAGEMENT TEAM will be mentored by a professional 5th Avenue stage management team and will be responsible for rehearsal preparation, coordinating rehearsals, running technical rehearsals, and overseeing technical aspects of performances. Ideal candidates are passionate about being organized, experienced leaders, detail-oriented, and interested in learning one of the most crucial roles of putting on a show.